The past week or so I have been walking by Warren Towers and I can’t help but notice this big sign outside of the restaurant Olecito which boasts about having Boston’s best burrito. Followers of this blog over the summer know I’m always down for discovering Boston’s Bests (Burgers! and Chocolate Shakes!) so I need to challenge this little sign’s credibility. So, as always, I’m leaving this one to the public. Normally I like to have you all give me ideas for what’s the best and I go try them, but this time, it’s an open debate. 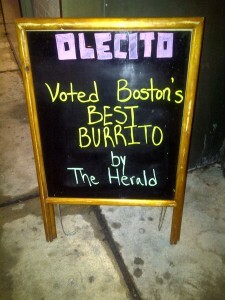 What’s the BEST BURRITO in Boston? Tweet and comment as much as you want. The winner will be posted as BU FYI’s next blog of the Boston’s Bests series. Until then, keep being you, BU. And nom some good Mexican food for me, will ya? This is the most overrated food declaration ever. Not only are Olecito burritos have barely any meat, but the ingredients they use contribute nothing to it’s texture or taste. Even though Chipotle is a larger, national brand, they still manage to use the freshest ingredients around and ONE burrito from this place and you will be full for hours. They shove it chockfull of beans, cheese, sour cream, and especially everyone’s favorite–tons of guacamole. As a pretty reputable newspaper, I think the Boston Herald should reconsider who it asks and how it conducts its surveys. Im pretty sure a true mexican place will be better burrito than theirs. I prefer to homemade, make your own burrito.